The rising pitch of his daughter’s voice made Domerin’s ears twitch. He had known when he let his personal com pad buzz unanswered for twenty minutes there would be a growing amount of hell to pay. But he was never quite prepared for the ferocity of his daughter’s anger. Perhaps he should have waited until they could have this conversation in person. That might have made it harder for her to yell. Who was he kidding? If he had done this in person, she would have smacked him. And he wasn’t entirely certain he didn’t deserve it. “And you didn’t think it was important to see me? To talk to me?” She was almost squealing by the end. That shut her up. Robin clamped her jaw closed, pressing her lips into a thin, pale line. Her silence lasted only a moment before she drew a deep breath and opened her mouth to launch another rant. The anger and indignation in his daughter’s eyes had faded to sorrow which stabbed through the core of him. How many times had she imagined a happy reunion and he had gone and ruined it? Then again, she should know him well enough to know by now he had a hard time with these sentimental moments. Domerin had no idea what to say. He had hardly believed the tree could speak when he saw it himself, hadn’t known what to believe when it started putting information into his head. He kept expecting to wake up on the Immortals’ ship and discover he was in the midst of recovery from severe wounds. That would have made more sense than all of this. He made a mental note to give the man a raise and decade’s worth of back pay at the first opportunity. Domerin opened his mouth but no words came out. Not only had she spent the last ten years believing he would come back to her, she had spent those years building bionic replacements he might never use. Oh, there was rock bottom. Domerin had tolerated his daughter’s infatuation with that upstart mostly because he believed she would eventually grow out of it. Despite everything he’d said just before he left about the two of them getting married and being ridiculously happy. At some point during the upcoming shuttle ride, he was going to have to figure out how much he meant it when he said those things. Domerin managed to disconnect the call before he choked. He spent the shuttle ride in silence, trying to digest all the new information his daughter had thrown at him. It was impossible. He filled the growing ache with cold, impersonal information. At his request, Rilan sent him the company figures from the ten years he’d been missing. Mission dates and reports, prices and costs, profits. It seemed his outfit had done well in his absence, at least in part because of the fame generated by his ‘heroic death.’ He did his best to avoid references to himself on the net. They made him want to gag. When they reached the surface, when he ran out of useless information to parse, Domerin finally sent a message to Crescent to ask if they still had a relationship. He wasn’t surprised when the man told him that he had refused to move on. Robin would have told him about her conversation with the tree. And while it seemed Crescent’s culture allowed a Kattar to choose a second time if their first partner passed, he had steadfastly refused while there was any possibility Domerin might return. For the Erenenth, ten years was the blink of an eye, barely worth noting. And his daughter was half Erenenth, which likely left them plenty of time even with the missing chunk. Though it seemed he had managed to miss more of the important years. But the Kattar were a short-lived species. They didn’t even live as long as humans. To have lost an entire decade of his life with Crescent was a blow, an agony he’d be forced to face sooner or later. One thing that hadn’t changed in the last decade was alcohol. Whiskey still provided the same familiar fire as it seared a path between his throat and his stomach. But it took too long to dull his thoughts. Why couldn’t he ever manage to be around for the births? 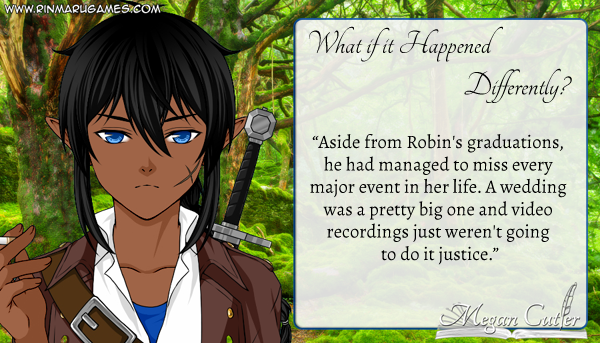 And aside from Robin’s graduations, he had managed to miss every major event in her life. A wedding was a pretty big one and video recordings just weren’t going to do it justice. He hadn’t been there to hug her, or give her away. He wondered who she had recruited for that task, or if she had just brazenly strode down the aisle to present herself. It seemed like the kind of thing she would do. He glanced over the rim of the first empty glass at Aran, the grizzled old mercenary now retired from active service. Domerin had spent five hours fearing the worst with the rest of the man’s companions, uncertain whether Aran would survive missing the hasty departure. It was sobering to realize that Aran had spent a decade mourning their deaths instead. Was it a boon to have old friends returned to him? Or had it only ripped open old wounds? The marks of those missing years lay on his old friend, obvious to another mercenary’s eye, but he tried not to pry too deeply. Every man deserved to maintain his secrets. “Can I ask you something?” His voice was rough already and he cleared his throat to ease it. “Yeah, but this one’s different. Personal, I mean.” Domerin set his glass on the table, knowing his friend would refill it without his having to ask. Aran waited until he set the bottle aside, then nodded. “How do you feel about… being a grandfather?” It was still a strange word, as if he hadn’t ever understood it until this moment. A smile spread across Aran’s worn features and Domerin relaxed. It wasn’t the kind of thing he’d have been comfortable talking about, but it seemed Aran didn’t mind. “Proud? Of yourself?” He didn’t think the grandfather had much to do with it, honestly. Domerin grunted and lifted the whiskey back to his lips, letting the burning sensation as he swallowed drown out his thoughts for a moment. It was true. Domerin kept telling himself it was. But he couldn’t help thinking that he should have been able to do something about it. He should have kept in touch with Robin’s mother enough to know she was coming, and he shouldn’t have gone on some damn fool mission when he had a family to take care of. Domerin muttered something unintelligible under his breath and downed the last of the liquid from his glass. This is why he didn’t like contemplating meaningful events. There were always a thousand what-ifs and his brain only seemed to care about one. There were other places to drink when he finished talking to Aran, bar tenders willing to keep his glass full as long as he was willing to pay. But he never seemed able to keep ahead of his racing thoughts. Other conversations droned in the background. The other members of the Immortals who had traveled with him on the five hours turned decade trip wondered what to do with themselves now they’d come home. They were looking for jobs, for meaning and purpose in this updated world. It wasn’t a problem he shared; he had a job and a life to go back to, but they had moved on without him. “Only the parts I was too drunk to remember.” For a moment, it looked like Robin planned to punch him, but thought better of it. Robin sighed and rubbed her palms across the tops of her worn jeans. It had been relatively easy relating everything that had happened since they parted ways, at least on his end. She had rather more territory to cover and he wasn’t entirely sure he was ready to hear it. “Was it a nice wedding?” he asked when the silence stretched, wondering if she didn’t know where to start. Domerin’s stomach dropped but he kept his expression neutral. He had noticed her husband’s distinct absence and wondered if he was waiting in the bedroom for a signal to come out. “Beth?” he couldn’t keep the tremor out of his voice. “Short for Elizabeth.” For a moment, Robin’s smile was so dazzling it made his heart ache. They waited several seconds but heard no sign of the girl’s approach. “What is she doing?” Robin muttered, sliding to her feet. “Maybe she’s shy,” Domerin suggested. “Isn’t that Daniel’s last name?” Or had she married some other Daniel? Domerin blinked. Robin’s grin grew larger. Domerin could almost see the stink-eye his daughter had given her boyfriend until he agreed to sign off on the new name. A name he hadn’t ever liked to begin with. And he had missed it. Drat! Hopefully someone had caught that portion on video. “Mommy?” The small voice drew both their attention to the doorway. The child peeking through the open arch was a perfect blend of his daughter’s features mixed with those of her husband. She had Daniel’s nose and chin, but Robin’s delicate cheek bones and intense eyes. The moment he laid eyes on his granddaughter, Domerin’s heart lodged itself in his throat and refused to be moved. He had never imagined having a child in the first place, now there was a whole new generation of Lorcasfs to watch grow. It seemed he had only missed four years this time, but he was determined to be around for the birth of the next one. If there was a next one. The girl looked at her mother, waiting until Robin nodded to shoot out from behind the door and straight into Domerin’s arms. The girl pressed herself flat against his legs so that she could wrap her arms around his waist. Could people melt? He was pretty sure he was melting, or else something strange had happened to his body. Robin hadn’t even installed the new bionics yet. He bent and lifted the child onto his lap and she snuggled close against his chest, much as another little girl had once, long ago, the first time they met. Domerin wasn’t sure what his face looked like when he realized what she meant, but based on the bright peels of Robin’s laughter, she must have found his expression hilarious. Please check out what my writing partner did with this one as well!